Like to get things done fast? We have just the solution for you. 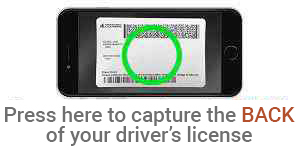 Take an image of the BACK of your US driver's license and we'll fill in some of your information for you. Not for you? No worries. Simply close this popup window to proceed. You are now ready to submit your application! By clicking on "I Agree," you authorize us to verify the information you submitted and obtain your credit report. Upon your request, we will tell you if a credit report was obtained and give you the name and address of the credit reporting agency that provided the report. You warrant to us that the information you are submitting is true and correct. By submitting this application, you agree to allow us to receive the information contained in your application as well as the status of your application. Not ready to move forward with your loan application online? Have questions? Our knowledgeable loan team is ready to help 24/7. Simply call us at 407-835-3500 and press Option 1. We look forward to serving you!